4 November 2014, at 11:03p.m. UK - At a ceremony in the House of Lords on 4 November, the Ladies In Pigs (LIPs) organisation received the David Black Award for their exceptional contribution to the country's pig industry. The Sausage Oscar, for services to bangers, was presented to Charles Baughan of Westaways Sausages. When Glenda Montgomery heard a load of pig farmers on a coach moaning about poor prices she put up with it for as long as she could, then stood up and berated them for whingeing. "For goodness sake get out there and promote your product," she cried. "If you’re so clever, YOU do it," they yelled back. "‘And I thought, damned if I won’t," she said. That eventually ended up with the creation of, Ladies in Pigs (LIPs), mainly by Glenda and Miranda Shufflebotham, whose members, over the years, have done an inordinate amount of superb work for the British pig industry. Now LIPs has won this year’s David Black Award, the highest honour the British Industry has to give. The Award was presented to LIPs chairman Sue Woodall by Farming Minister George Eustice [pictured above, with Stewart Houston of BPEX (left)] at an industry breakfast, held in the House of Lords. Ms Woodall said: “It is a real honour for us to be recognised by the industry but it really has been a tremendous team effort and once the members realise the magnitude of it, I’m sure they will be absolutely delighted. LIPs members have a packed schedule of touring shows, supermarket car parks, school and any other venues where they can extol the virtues of British pork using a flamboyantly coloured mobile kitchen. 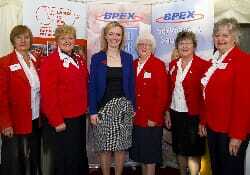 Most of the members are also trained judges for competitions involving pork and pies. The organisation started in the early 1990s, a time of real hardship for the industry and have gone from strength to strength. Lips now has more than 40 corporate members and a presence on Facebook, Twitter and have recently set up a new web site. Charles Baughan received the Sausage Oscar from Mick Sloyan of BPEX. 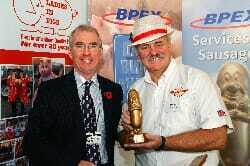 At the same event, the Sausage Oscar - for services to bangers - was presented to Charles Baughan of Westaways Sausages. He has grown the firm from one that provided top quality sausages to the South Devon area to a global sausage supplier. He said: “In the current economic climate businesses have been encouraged to think about exporting and I have been lucky enough to be helped into this by organisations such as UKTI (UK Trade & Investment) and BPEX.